Day 2 of Nanowrimo and I’m yet to write a word of Reality Check. I’ve had a late morning start as I’m recovering from the commitments of the last few days. See, this silly writer volunteered to photograph my organisation’s sporting event, which meant six different venues, six different sports, printing contact sheets and then setting up so that people could order photos at the dinner function. 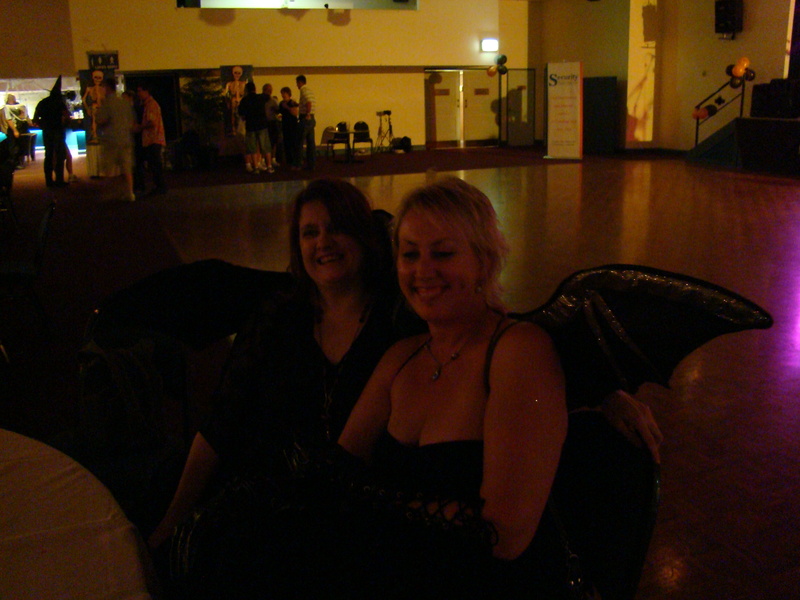 Plus there was a Halloween party on Friday night and I also took photos of that and got to spread my vampire wings again. This time I had a sister vamp with me, Andrea. I have wing envy – Andrea’s wings sparkle on the inside and the outside! My attempts at cloning failed miserably so I did not take as many photos or cover as many games as I wanted to. At the main venue, there were three touch footy games going on, plus a softball game. I guess it’s Murphy’s law that when I had my camera trained on the softball, the major tries were happening right behind me and I’d missed them. Shrug! I did my best and I did have an assistant who managed to get some excellent action shots of the netball. But then something came up and she couldn’t do the rest of the day. Despite being out from early morn to late at night, I still managed to write 1423 words for the first day of Nano. A feat I’m absolutely impressed with, and I no I can no longer make the excuse that ‘I don’t have time’. If I can fit writing into a day like that, I can fit it in to any of my days. But I am glad to say, thank God that’s over and now my mind and soul can return to Bilby Creek. I love how a story unfolds and minor characters assert themselves and let me know that they have a stake in the action. Now it’s back to my own boring reality check. I have to do some grocery shopping but when I return I will be word sprinting my way back to Bilby Creek. How cool are you Diane – to manage to write so many words in day like you had. Well done. Bilby Creek sounds fascinating. Check out the latest news from Romance Writers of Australia here"
Are you ghosting your life?